I went on AirTalk to chat about service and emotional support animals. This segment was mostly about letting callers give their thoughts, so I was able to kick back and listen. Travel Weekly took a quick look at how airlines recover from operational issues and found differences between point-to-point and hub-and-spoke airlines, as you’d expect. Where do they actually “store” the miniature horses? Most are the size of a large-breed dog. They’re pretty amazing to watch work, actually. When I was a FA, one came on one of my flights, and it was very well-behaved and calm (better than most passengers). Well, I don’t know when large breed dogs go (fit) either. – do bulk head rules (nothing on the floor, clear exit path) not apply to service animals? 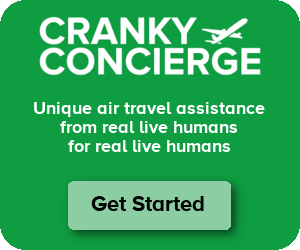 – do unrelated passengers have to accept service animals in their legroom area? From a regulatory standpoint, that horse should not be permitted to remain there during critical phases of flight (taxi, takeoff, landing), as it’s blocking access to the center aisle and thus, interfering with passenger safety. Most miniature horses are smaller than that one, and they would be on the floor in the window seat (again, not blocking the user’s access or anyone else’s access). The SAs with which I’m familiar are able to crawl into a tight ball underneath the seat in front of the passenger’s feet. In the “old” days (dating myself), bulkhead rows had greater floor space, so most persons traveling with SAs would request the bulkhead, but as this photo shows, that’s not the case. Additionally, airlines are not required to automatically seat persons with SAs in bulkhead seats for free if there is an upcharge for a bulkhead seat (as many air carriers are doing these days). And, no, unrelated passengers do not have to accept SAs who might interfere with their legroom or passage to the center aisle. Great questions, Oliver. Now only if they could deal with quack doctors who for a “small fee” will diagnose you with PTSD so you can have fluffy fly with you. I just found one with a “No Approval, No Fee” model. I told one customer that his laminated ID card and special vest he bought off the internet doesn’t mean anything to me unless he can produce the doctors note. Those in the industry know what kind of “service” animal the ID claimed the animal to be, so he couldn’t backpedal and make some BS story up. It was doubly-fun when he asked for a CRO and the CRO didn’t bend either. I’ve had some smart ones know what I can and can’t ask for. I’m sorry, little miss orange-tan heading to SNA… I don’t believe your little frigging pouch poodle is there for “nut allergies” when you’re munching on trail mix. Right on! Passengers are getting smarter every time they fly, and there are doctors (or so-called physicians of some sort) who are willing to “prescribe” an ESA for a small fee. It’s illegal in many states to fraudulently claim an animal is an SA or ESA, but no one wants to test this for fear of being sued for discrimination (or lambasted on YELP!). It’s a sad state in aviation right now, for sure. breathing (a very essential life function) of allergic people for days, if not weeks after the animal has left. Many people who are not allergic do not realize this. There needs to be a government body who certifies service animals and issues special ID cards that people would have to show. Humans are animals, too. If I wear a special vest and leash, could I be my wife’s emotional support ape and travel for free? Double dog dare you to try it! Report back. I think you’d be amazed at the (lack of) response. Problem is I wouldn’t fit in the space under the seat in front of my wife. So I would be in the barn for the companion miniature horses, I guess. See above. LOL! It’s worth a try! The vast majority of these emotional support animals are a complete scam. People who perpetuate this scam don’t want to pay the fee and they want the convenience of having their dog or whatever animal with them in the cabin. Just the other day I had a pop-up ad for some quack doctor that would write you a letter for $149. It also cracks me up when I see the service animal vests on these dogs. You can buy those on the Internet too. just another example of you give people an inch they take a mile. This type of behavior gets worse and worse with each passing year. the spoke and hub article doesnt seem to discuss such things as flow through flights where they fly to an outstation from a hub then fly to a completely different hub when coming back . I find these to be the most frustrating flights to deal with from an airline perspective. Doesnt this also affect performance as it affects crew connections and reduces the options for recoverability since its not schedule to come back to the same hub it left? Yes it does indeed. I did talk about that with the author, but he was pretty focused on hub vs point-to-point, which does make a difference. But how you run each model also makes a difference. Flight Attendant here. I really don’t care what animals are on the plane as long as they are well behaved. What gets me are the ones who get loose and run up and down the aisle while the owner was asleep. Usually the animals who can’t handle being in confined spaces make it known during boarding and will start barking, growling, snarling, etc. When we see that, they don’t fly. *blink* I’m sorry, did you just say your EMOTIONAL SUPPORT dog is nervous? Ooookay then. HI Cranky! I am the FAA representative to the DOT on the negotiated rulemaking committee that’s addressing the definition of service animals. It’s been fascinating (and annoying) to participate in these negotiations and to listen to the airline representatives’ and the disability communities’ arguments. Thanks for your presentation on this (emotional) subject. I’m shocked at the people who called in to the show–a dog who detects bed bugs? the person who thinks no animals should be allowed on an aircraft? (ADA, anyone?) There is so much misinformation out there, including a misuse of the terms (service/support/companion animals, for instance) that clouds this subject. Additionally, there is a conflicting adoption of the definition of a “service animal” among Federal agencies (DOT/Air Carrier Access Act versus DOJ versus FHA, etc), which is confusing to people. Lastly, the ACAA currently permits specific breeds (dogs, miniature horses, capuchin monkeys in cages) as SAs, but the regulation regarding ESAs is more lenient and includes cats, rabbits, reptiles, and fowl. People can jump on the internet and, for a small fee, get a certification letter from an unknown physician/psychologist/psychiatrist that states that said animal/reptile/bird is their ESA and should be permitted to travel on an airplane (even if it has never been in a carrier or outside of the person’s home, which is where the misbehaviour happens). It’s a mess. First, Catherine, thank you for your helpful information. In addition to tightening the definition of Service Animal and how they are certified, some changes need to be made to protect allergic passengers, including passengers who may be on subsequent flights hours, if not days or months after a flight with a service animal. The hair and dander and even saliva can remain on carpets and seats for a long time after a flight and can severely affect the allergic, including their breathing, which is perhaps the most essential life function. Accordingly, this must be considered in any policies. That is why service animals (especially dogs and cats) on flights should be minimized to the maximum extent possible, while only being allowed for those who truly need one for an essential life function.that will be necessary on that flight. Accordingly, a service animal that is trained to get help in the case of an emergency is not needed on a flight when there are lots of other people on the flight or at an airport that can summon help if needed. Still there will be some cases where a service animal may be essential for an essential life function and most of those cases would involve the blind and seeing eye dogs. In cases where a service animal is essential, there should be designated (and relatively small, as there should never be too many animals on one flight) seating areas in each class (similar to the old smoking sections) where the animals can stay. This way more attention could be paid to cleaning those areas (although even the best cleaning can leave some allergens behind). Also, the allergens in other areas of the plane would be greatly reduced. Further, animals should not be allowed on seats. The way things are today a person with a “service animal” can (and do) let their animals on a seat and on a subsequent flight an allergic person may sit in that seat and may not only have an allergic reaction at that time, but are likely to pick up the allergen on their clothes which they will then bring home with them and get in their homes. This is very dangerous for the very allergic. People who are not allergic do not think of the implications on later flights of bringing a “pet” on board. I appreciate your concerns about allergies. The ADA requires air carriers to accept all SAs presented for travel, so it’s against the law to deny access. And as we know, there are various degrees of disabilities and life function needs, and there are many types of SAs that provide essential functions for someone, so it wouldn’t be acceptable to only permit seeing eye dogs, as you suggest. I have raised SAs for a well-respected SA organization, and I traveled with a towel, which I placed on the floor before my SA went into a down position and stayed the entire flight, to reduce the hair/dander. Additionally, a good SA organization would ensure that its graduates groom their SA regularly, which helps to reduce the amount of hair and dander that are left by the SA. SAs should never be in a seat, and I think that’s one of the key “signs” that an animal is not an SA when someone holds the animal in their lap. It’s a balance for airlines to accommodate all persons with disabilities, including the physically challenged, hearing impaired, and those with pet allergies. And to clarify, SAs are not pets. There are air carriers who do not accept pets in their cabins, and that might be useful knowledge for those persons who are allergic to animals when making flight reservations. At the risk of pouring gasoline on an ember, my thought is the whole ESA thing is a scam. Not to be harsh but if you can’t spend a few hours on an airplane without a dog or other semi-domesticated house pet, you probably don’t belong on an airplane. Period. Had the misfortune last summer of being in first class and having a 50 pound dog sitting on the floor next to me. You adapt as best you can because there’s nothing you can do about it when the dog and its trained human sits next to you. But it is nerve-racking and frankly, the reason I fly first is to get work done and that certainly did not happen on that trip. Nor did I like getting the “look” from the canine as I ate. P.S. — I have no problem with SAs but this dog was not an SA. Thank you for your informative response. I must say the towel on the floor would be an excellent requirement. In addition, if an animal is ever caught on a seat, there should be a seat cleaning fee/penalty and possibly a ban on that person ever taking an animal on board. Further, I do feel that the law and/or regulations should consider and balance the needs of the allergic against the real “need” for a SA. The SA should only be allowed if it is essential for an essential life function. Thanks for chiming in Catherine! And for the record, I have sat next to passengers with small animals (cat, dog) and there haven’t been any issues or problems (I am not particularly allergic).